We are co-directors of the Cold Case Justice Initiative and faculty members at SU College of Law. We want to take this opportunity to comment on what is happening on campus with The General Body. We want to be clear that we have not introduced our concerns about CCJI to the students. However, we understand the students’ call for change in the way decisions are made. These decisions (e.g. withdrawal of support from nationally recognized SU efforts, particularly ones concerning issues of importance to African American and other minorities) are made without meaningful input from the populations who are most affected. The decisions then are expected to be accepted without objection or complaint. This has been the problem with the Advocacy Center, the Posse program, the mission statement, fast forward and others items on your agenda. An apology about the process is not enough. Listening groups are not enough. Vague assurances to allow more input are not enough. This is an important moment in your administration. Positive decisions need to be made that ensure the integrity and continuance of these critical programs. We have had an opportunity to attend various meetings and programs of the Posse Atlanta. We were very impressed with the quality of the program, the quality of students chosen and the intense involvement across the Atlanta community in this effort. The students we have met who have come to the program return to Atlanta praising their experience at SU and supporting the new students who join Syracuse University. Our Atlanta Alumni Regional Council has been very involved in this program; indeed as you know, Board of Trustee Member Rey Pascual was one of the initiators of Atlanta posse. Likewise Angela Robinson, also a prestigious alum and member of the Board of Advisors for Newhouse, helped to establish this program and remains a staunch supporter. The whole Atlanta community is very aware of Syracuse’s presence and work in the Atlanta area, including Posse, work by Newhouse and work by the Cold Case Justice Initiative there. Many of them are concerned that Syracuse may withdraw support from these successful regional initiatives. In the proposed new mission statement, the dramatic elimination of a commitment to people of color in admissions, support, scholarships, safety, recognition and programs that directly affect them is distressing and frankly insulting. This is not about general diversity which tends to dilute the obvious and direct problems that affect traditionally marginalized individuals and groups – people of color, people of different abilities, sexual orientation, and gender identities. This University has established a reputation for supporting and encouraging these groups to come to this campus and thrive. However, when the students identify problems or a change in that commitment your discussion of the advantages of general diversity, general scholarship opportunities or other priorities diminish the message to these students and their allies. Furthermore, the University’s message about the new direction troubles those of us who see what is happening to all of our previous efforts to create a place that supports and sustains these initiatives. The message you are sending is giving credence to those who believe that students of color bring down the academic standards of the university. This unfairly and inaccurately blames those diverse populations. If this is not the message you mean to convey, your activities should directly confront this racist connotation through actions, words and policies, including those that the students urge. 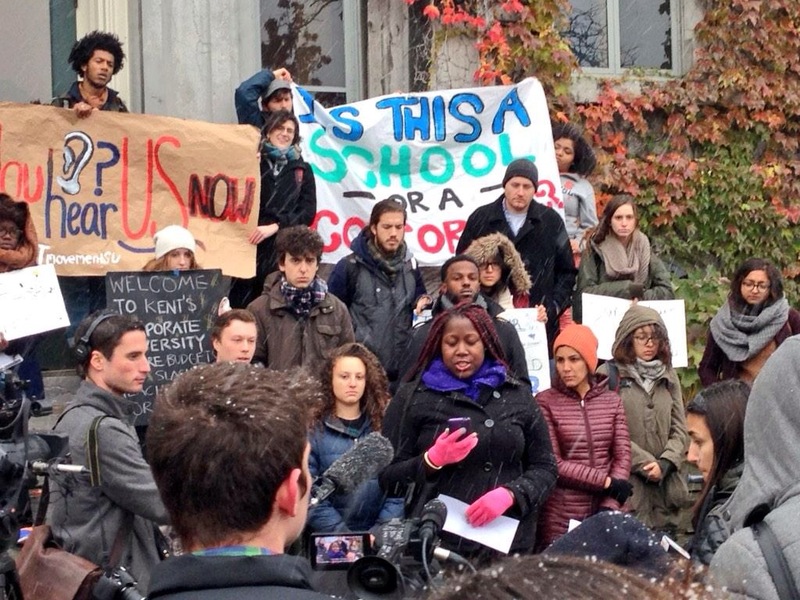 We applaud the tenacity and the thoroughness of the student action. They are dedicated, prepared and very organized. 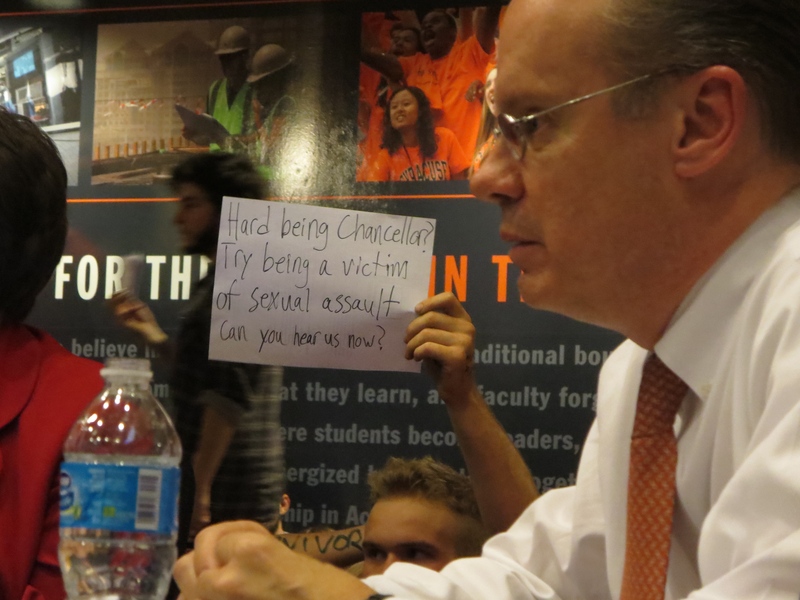 They are truly concerned about these issues, this institution and this community. Many of us on the faculty support and respect their peaceful efforts to procure a commitment from the administration to move forward in an integral and concrete manner with specific terms and deadlines. We urge you to take Immediate actions to order DPS to cease intimidation with their barrage of ever-changing rules and requirements aimed at the students who are sitting in Crouse Hinds. Further, we urge you to ensure that the building remains heated while students are there. Thank you for your attention. We hope to soon feel better about the university that we have served for over twenty years. We have produced passionate, skillful, and dedicated advocates from our students at CCJI. 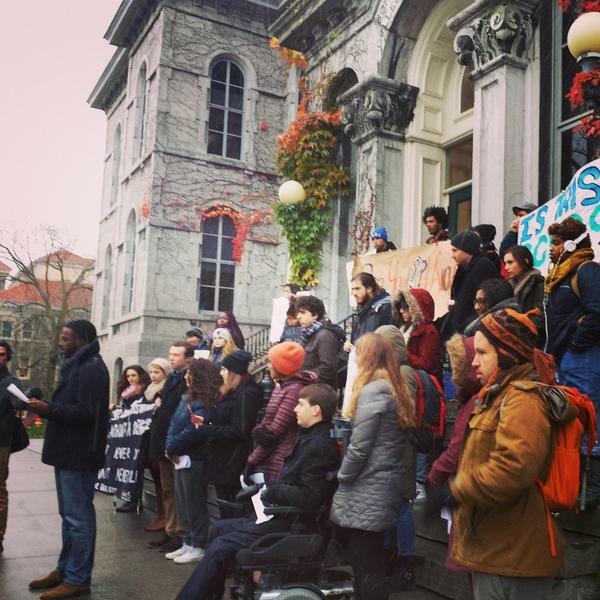 It is this sort of passionate advocacy that we are witnessing as this broad coalition of students who comprise The General Body insist that Syracuse University reach its potential to be an inclusive environment in which to learn, teach, work, and live. I am writing to both state my support for THE General Body and to urge you to continue working with these students. The issues this group has raised, and the intelligence with which they have advocated for them, are deserving of strong engagement. 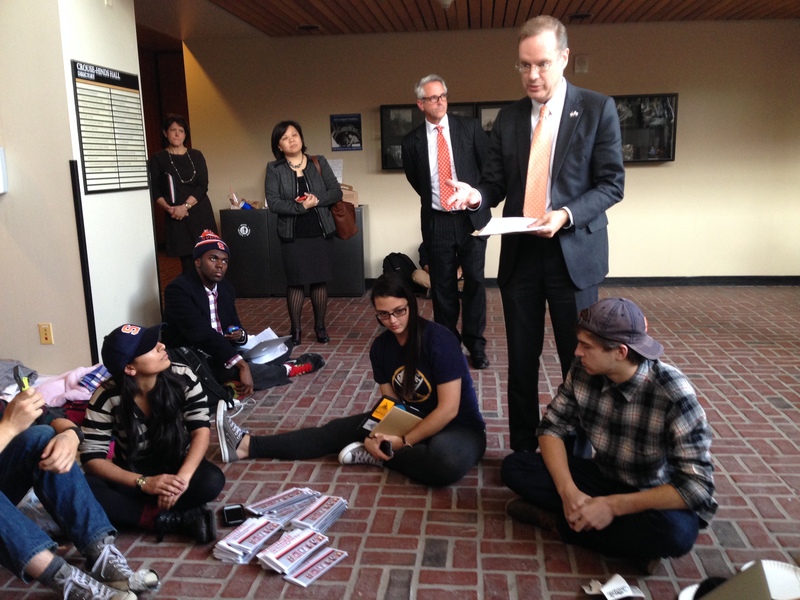 I am very disappointed by your and your administration’s actions this week: you stopped talking to these students when you made your “final response,” built a wall around Crouse-Hinds, intimated student leaders with threats of disciplinary action and then denied them legal counsel. The energy spent on harassing the protesters would be better spent actually solving the issues THE General Body has raised. Please do not continue down this path. Instead, I ask that you continue to work with these students, to listen to them, and to work towards making positive changes. These students are working for the betterment of the University. These students are creating a great community here. While our institution’s official bodies such as the Board of Trustees, the Student Association, the Graduate Student Organization, the University Senate, each college’s faculty governance bodies, and many other committees do work on many issues; I have found that informal, ad hoc groups have much to offer in terms of generating ideas, mobilizing people and creating an active community. 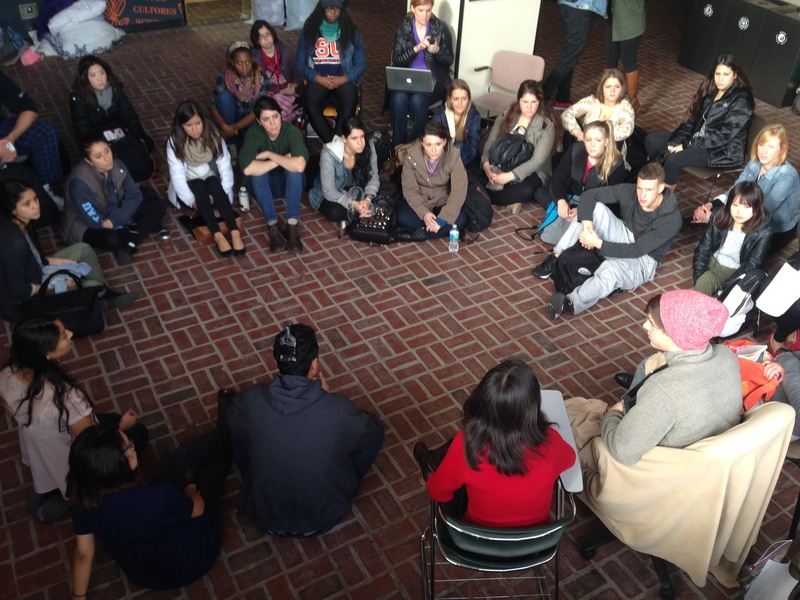 It would show great strength if SU’s administration could engage with these groups fully. THE General Body formed in part because the official avenues were not able to make changes that would only improve Syracuse University. I want to be hopeful about good change happening here, and THE General Body has given me more hope than I have ever felt during my long relationship to this institution. The many issues they have raised are long-standing. I ask you to do things differently and to be open these students. They embody the best of SU. I am writing to implore you to allow the students in The General Body to access legal counsel. I am dismayed and greatly disappointed that the university would act in such an egregious manner and clear disregard for the students’ legal rights. Although it may be considered an unfortunate means to an end, there is an incredible opportunity and urgent desire by students, faculty and staff for real and powerful change to take place across campus. I am so proud to be part of a community so committed to speaking out in order to promote more inclusive participation and governance. Chancellor Syverud please engage our community in a way that seeks real and meaningful change and be willing to change plans when it is clear certain decisions were not the right ones; great leaders can and do this. THE General Body at Thursday’s press conference. Moments of challenge to the status quo are the ones that test us. I realize that you are in a difficult position, having been hired by the Board of Trustees, so you perhaps feel that your primary responsibility is to them, as a CEOs is to a corporate board (and to financial share-holders). 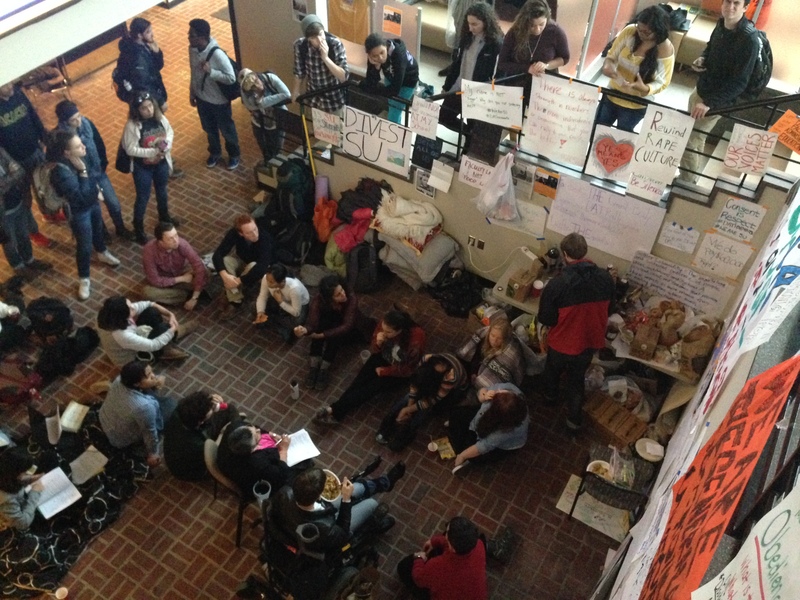 This might make you hesitant about affirming student (or faculty or staff) challenges to directives you feel you were given by the Board— including, perhaps, to make “problems” such as student protests go away. But this understanding of governance is a misunderstanding imposed by the way that private universities are structured, not the only way of imagining how chancellors could or should lead. As the AAUP Centennial Declaration underscores, universities — even private (non-profit) ones –have a primary responsibility to the public good, which means its “shareholders” cannot be understood to be primarily represented by the Board of Trustees. Even though the Board of Trustees hired you, then, I hope that you will use your position to us to educate them, not to impose their dictates on us. The values of open-ness, inclusion and transparency the student protesters affirm, after all, are the antithesis of the way the Board operates, and, apparently, what it encourages you to uphold. In choosing between the two, the demands of eduction, justice and community point overwhelmingly in favor of the values visible in the student protest. I hope that you will use the challenge offered by the student protest, then, as a chance to learn more about this community that you so recently entered, and take this knowledge to the Board so that SU can finally realize in its structure fully informed and truly shared governance. I know that I have learned a lot from the students myself and am disappointed that you would use heavy-handed tactics to try to disburse them—such as attempting to ignore them to death, as well as delivering threatening letters to student leaders–rather then welcoming them as part of your own education and the eduction of the larger campus community, which should protect and nourish voices most in danger of marginalization, not seek to silence them.